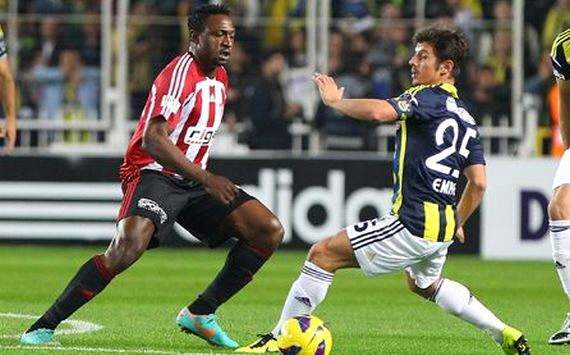 The Kasimpasa striker made the game safe for his team on Sunday and hauled them to third position on the league table. Victor Anichebe was full of running on Saturday as Everton laboured to a 1-0 win over Stoke City to move into sixth position, two points behind Arsenal and four behind Chelsea in fourth position. Anichebe had a right footed shot on15 minutes which was saved. He also had another attempt blocked in the 54th minute. In the 78th minute, another right footed shot from the centre of the box missed to the right. Anichebe had 89% accuracy from 23 touches and won 14% of his aerial duels. Chelsea lost 2-1 to Southampton on Sunday to drop to fourth position on the table with Arsenal just two points away in fifth. Both Victor Moses and Mikel Obi started the match and finished as Rafa Benitez tried juggling his squad in preparation for the FA Cup quarter final replay against Manchester United on Monday at Stamford Bridge. After going down a goal, Mikel tried a right footed shot in the 36th minute which went wide. In the 59th minute, his compatriot Moses had a go with another right footed shot but that was parried for a corner kick. Moses missed another attempt in the 81st minute when his header went marginally wide. Moses had 79% accuracy from 49 touches and completed one successful dribble while Mikel had 84% pass accuracy from 42 touches and attempted one shot at goal. Despite all the Twitter rants, Peter Odemwingie played some minutes for West Brom in their 3-1 loss away to West Ham on Saturday. Odemwingie came on for Claudio Yacob in the 71st minute. Kalu Uche scored in additional time for Kasimpasa against Bursaspor on Sunday to lead his team to third on the league table with 43 points though they have played a game more than fourth placed Besiktas who have the same number of points. It was Uche's 16th league goal in 27 games and the Nigerian is second on the goal-scorers table, two goals behind Buruk Yilmaz. Michael Eneramo scored as early as the sixth minute but David Barral replied for the visitors in the 16th and added the second in the 75th. Sivasspor's blushes were saved by two quick fire goals from Hakan Arslan in the 85th minute and the winner in the 90th by Ricardo Pedriel. Eneramo last scored on February 3 against Fenerbahçe and he has now scored eight league goals with seven league games remaining. John Utaka played all 90 minutes of Montpellier’s narrow 1-0 loss to PSG at the Parc des Princes last Friday. Utaka had two chances to score in the game - in the third minute, his right footed shot from outside the box was saved by Salvatore Sirigu and in the 87th' minute, a cross from Hilton presented a heading chance to the Nigerian, which he took but Sirigu saved again. The Nigerian had 86% pass accuracy from 43 touches and won a third of aerial duels while also tracking back to win three tackles and help left-back, Henry Bedimo. Utaka has scored five times in the league this season as Montpellier sit seventh on the table with 45 points with eight matches left in the season but will continue to play to get into Europe again next season. The drought continues for Brown Ideye for Dynamo Kiev but they won 2-0 away against Chornomorets on Sunday. The Nigerian striker is yet to score after his return from the Nations Cup. Taye Taiwo and Lukman Haruna also started the match with Haruna making way for Roman Bezus in the 87th minute. Ideye has scored 13 times in the league, Haruna twice and Taiwo is yet to score after 14 league games. Kiev stay second on the table with 46 points. Michael Babatunde stayed on the bench for all 90 minutes as Kryvbas drew 1-1 at home to Metalist while Abayomi Seun came on in the 66th minute to help Volyn get a 1-1 draw at home against Dnipro Dnipropetovsk.